JILLE mattu Talokugala UDGHATANE samarambhagalu. MYSORE: Odanadi, a voluntary organisation working for the rescue and rehabilitation of exploited women and children, appears to have found a soul mate in a group of volunteers in the United Kingdom (UK). The interest shown by the group of committed volunteers from the UK has given a much-needed boost to Odanadi, which in Kannada means “soul mate”, for the helpless victims of human trafficking. Odanadi Seva Samsthe, situated in Hootagalli on the outskirts of Mysore, has been providing shelter to more than 90 rescued women and children. It attempts to erase the scars of a troubled past through the process of reintegration and empowerment. So far, Odanadi has rescued more than 400 girls, mostly minors. Exhibition of committed volunteers from the UK has not only floated Odanadi UK, and begun working on a website www.odanadi-uk.org , but it has also lined up a series of programmes to raise the profile of Odanadi. One among them is an exhibition of photographs in the House of Commons later this year. The exhibition will feature the photographs taken at Odanadi during December 2007 and January 2008. “The women and children were able to use digital cameras to document their lives at Odanadi,” said Sarah Harris, a representative of the committee of Odanadi UK. Ms. Harris, who is a freelance journalist visiting Mysore, told The Hindu that a member of the UK Parliament, Virendra Sharma, who hails from India, had evinced keen interest in the project. When the representatives of Odanadi UK met Mr. Sharma recently, he said that “supporting Odanadi UK means that I can do something positive for those affected by human trafficking in my homeland. I very much look forward to developing my relationship with Odanadi UK and hopefully I can visit Odanadi in the near future”. Meetings The volunteers have begun holding periodic meetings to enlist supporters for the cause and help Odanadi to recruit specialist teachers and therapists to provide continued support to the women and children. Odanadi Director Stanley said the gesture of Odanadi UK would go a long way in helping the organisation secure specialist counselling and therapy for its victims. “Counselling is an important aspect of rehabilitation at our centre. But, finding full-time counsellers with social commitment is not easy to come by,” he said. Another Director of Odanadi, Parashuram, said the organisation has been attracting volunteers from all parts of the world. Bangalore, Feb. 9 (DV)- Kan-nada Sahitya Parishat has instituted a new award — Nrupatunga Award. This is considered to be greater than the Jnanpith Award in the field of literature. Nrupatunga Award is a State-level award which will be given every year to those who contribute diversely for the well-being of the State. 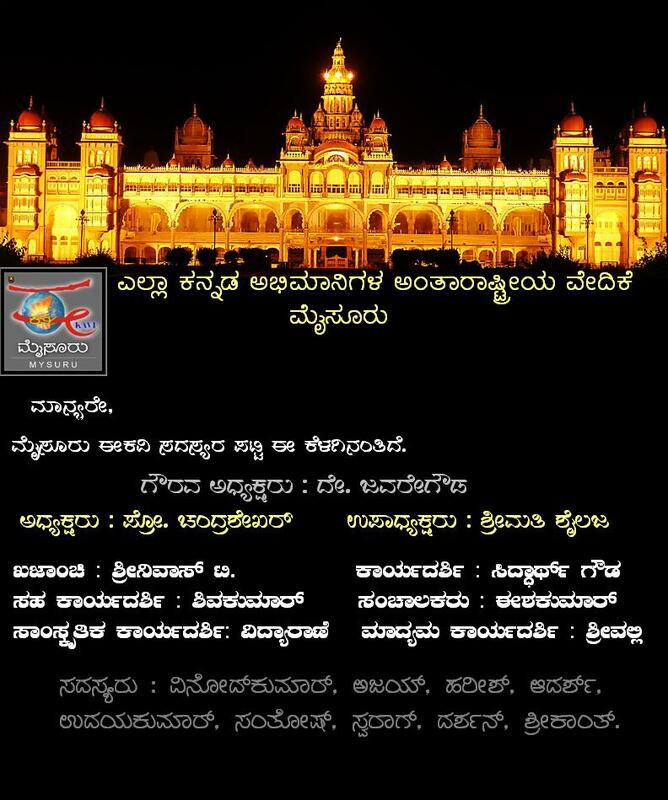 Kannada Sahitya Parishat is all set to present the first award this month. The award sponsored by Bangalore Metropolitan Transport Corporation (BMTC) has been titled as “BMTC Nrupatunga Award”. BMTC has instituted an endowment of Rs. 1.5 crore in Kannada Sahitya Parishat. This endowment carries the highest amount among the other endowments in Sahitya Parishat. Jnanpith Award carries a cash prize of Rs. 5 lakh. Nrupatunga Award is greater than Jnanpith Award as it carries a cash prize of Rs. 5 lakh and one rupee. Former VC of Mysore University and Nadoja Awardee Prof. D. Javaregowda has been selected for the first award, which will be given in the third week of February. Efforts were made to invite President Pratibha Patil to present the award. As she is unable to accept the invitation due to pressure on time, Dr. Abdul Kalam will present the award. E-Kavi Balagada ella sadsyarige nanna namanagalu. Dinanka January 19 sanje 7:30 kke Jawaraiah Udyanavanadalli nadeda Mysoru E-Kavi sabe yalli e kelakanda vishayagala bagge charchisalaaithu. Mysoru E-Kavi vathi inda mundina tingalu andare Febrauary 17 randu Mysoru E-Kavi balagada udghatana samarambha haagu Bhavageethe mattu Chitrakala spardegalannu hammikollallu tirmaanisalaithu. vibagagalalli Mysoru nagara pradeshakke seemitha vagi nadesalu nirdarisutteve. T. Srinivas, Rtd. Engineer, Mysuru. Esha Kumar, English Teacher, H.D Kote, Mysuru. Note: Shiva Kumar and Vinod Kumar could not attend because of Family reasons. 12th Janauary 2008, Jawarey Gowda Park, Saraswathipuram, Mysuru. Timings : 6.00pm to 7.30pm. Vinod Kumar, Student and Medical Transcriptionist, Mysuru. Shivakumar, Kannada M.A., Student, Mysuru. Ajay G., Graduate Engineer trainee, Larsen and Toubro Limited, Emsys, Mysore division. Udayakumar madbhavi, Student, Maharaja’s college, Mysore. Santhosh M C, Student, ITI college, Kuvempunagar, Mysore. naavellaru ottagi sabhey seri ee kelaginathey Ekavi kaaryanirvahisuvanthe nirdharisiddevey. February 17randu Mysuru Vishwavidyanilayada lalitha kaleygala college nalli zilla mattada prathibhanveshna spardey haagu mysuru Ekaviya udghataney beliggey 9.30kke. nanthara 11 am gey Bhavageetey spardey (for all school and college students in Mysore.) madyanha 2 ganteygey Drawing compitation (for all school and college students in Mysore.) Sanjey 4 ganteygey Carrer Guidence for SSLC and PUC students, nanthara bahumana vitaraney. Ee samarambhakke Vedantha Hemmige, De Jawarey Gowda, Rajashekara Koti ( Andolana Paper Editor), Halathi Somashekar ( Asst. Director, Kannada and Cultural Department, Government of Karnataka) Smt. Shreelatha ( HOD, Fine Atrs college, University of Mysore), Raju Anatha Swamy (famous singer, Mysore), Prof. Ramamurthi Rao K, Mysore. ishtu mahaneeyarannu aahwanisalu nirdharisalagide. mattey mundina vaara 19ney January sanjey 6.00 gantegey mattey sabhey seeri ee kaaryakramakkey anthima sparsha needalaaguvudu. nimma anisikey abhiprayagalu tumba mukya. Dayavittu nimma abhiprayagalannu tilisi. Please attend the meeting on 19th January 2008 at Jaware gowda park, 9th main, saraswathipuram, Mysore. At 6:00 pm.